L-Carnosine has been discovered 100 years ago, why hasn’t it became popular earlier? The huge problem with L-carnosine is that it “works” only In-Vitro. That means it works only in laboratory conditions when carnosine is being delivered inside the cell directly. A typical read met meal provides 250 mg of pure L- carnosine, but the problem is that is quickly degraded in the body by the carnosinase enzyme. What this means is that even if a person relied on red meat for their carnosine, it would not last long enough in the body to provide sustained protective effects. It is the same situation with supplements containing pure L-Carnosine. When using pure L carnosine supplements, the resorption is below 20%, usually around 10-15%. Karnozin Extra is a special product that contains L-Carnosine but protected from carnosinase. Formulation of Karnozin Extra ensures not only constant but also a high concentration of carnosine in tissues during 8-12 hours, therefore making it easy for consumption because you only need to consume it in the morning and in the evening in order to round up whole 24h period. With pure carnosine you would need to take carnosine supplement almost every 30min, but not only that, you would need much higher dosages (from 1mg to 2 mg every hour)! * Average retail price of 500mg of pure per capsule, this may vary slightly. 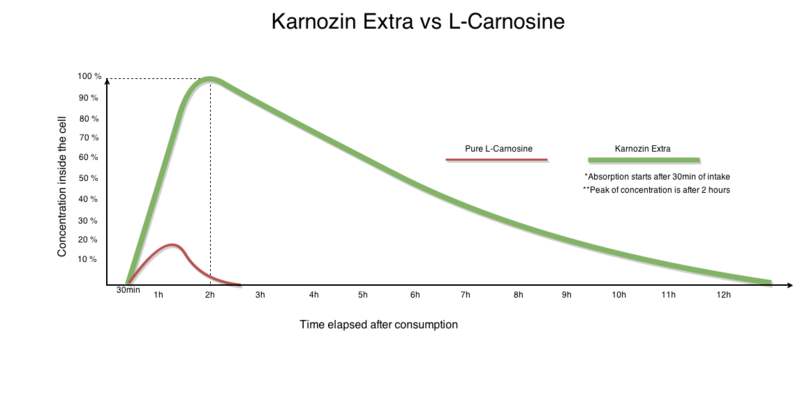 ** Since bio-availability of pure L-carnosine is roughly around 15%, we have adjusted the amount of pure carnosine in a capsule to theoretically correspond the amount in a capsule in Karnozin Extra. The preventive dosage of Karnozin Extra is 2 capsules per day.